The unique, patented system of interchangeable foam inserts can be arranged and rearranged to fit all body shapes and sizes, providing "personalized" comfort and support. Designed and tested by a leading orthopedic specialist. Helps reduce back strain and fatigue. Unique, patented system of self-adjustable foam inserts provides "personalized" comfort and support for all types of seating. 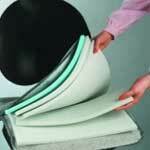 The only cushions on the market that allow the user to adjust their shape and their thickness. Hook and loop strips hold cushions in place on fabric covered seating. Adjustable strap provided for smooth surface seating. Ideal for use in the office, home or automobile. Made from flame retardant, washable fabric for easy care. Available in two coordinating colors to complement any seating decor! Ergonomically designed to support the spine in the proper position for day-long seating comfort. Allows the spine to assume it's natural "S" shape curve. 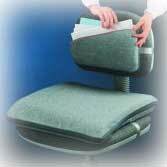 The forward tilt of the seat cushion relieves stress from the lower spine and pelvic area. When used as a back cushion provides proper seat depth dimension. Postural support and a stretching and flexibility tool – all in one! The BodyBolster™ is a back support as well as a flexibility and conditioning tool which is adjustable to fit any body shape and size. The BodyBolster is made from Torflex™, a soft, latex-free medical grade PVC that gives it malleability and a comfortable skin-like feel. What makes the BodyBolster unique is its adjustability—a valve allows you to deflate it with a squeeze, and with another twist of the valve it self inflates—there’s no need to blow it up! BodyBolster comes with a DVD user guide demonstrating 10 seated exercises to relieve back, neck and shoulder strain.